It's time to reveal the May kits at My Creative Scrapbook! I am excited to show you the projects I made this week with the Creative Kit, which features Doodlebug Designs. 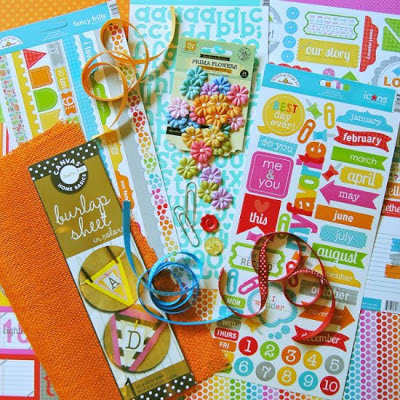 Doodlebug is known for its colorful palette and I couldn't help but smile when playing with these happy papers. 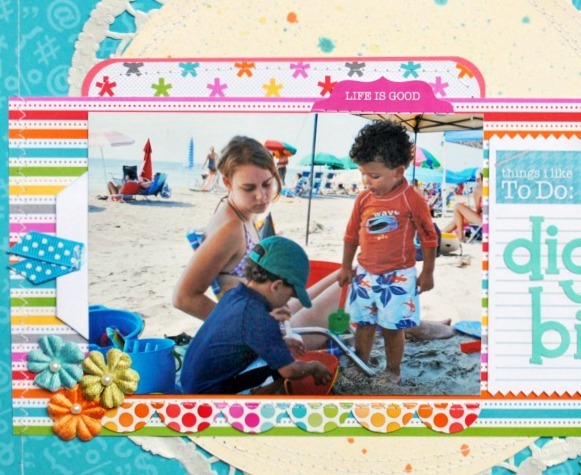 The Doodlebug collection is called Take Note and is office-supply oriented, but I found the colors perfect for beach photos. My Creative Scrapbook revealed all the May kits this weekend. You can find them here. I'll be back this week with more projects from this kit. Fun LO! Love those bright colours in the Kit! That collection was perfect for beach photos! This collection worked perfectly for your beach photo, Izzy! I love the fun, happy colors, the little flowers, the layering over the doily and the bits of misting too. What a fun layout! Love the bright cheery colors!!! This is gorgeous!!! I loveeeeeeeeeeee the colors!!! This is adorable! I have a really hard time seeing beyond office supplies (or whatever a collection's theme may be) and seeing the possibilities. You do it so well! Doodlebug is my favorite scrapping company, and you do it so well! Crazy cute layout! gorgeous!! Love how you used the big doily!! Looks great!! Love the bright colors. fun page! So cute!! Love how you put this all together! LOVE the Take Note collection! !